The SIG Roofing ‘Core Range Always Available’ programme is designed to ensure you can get your hands on everyday essential roofing products and a wide range of specialist items WHENEVER you need them! 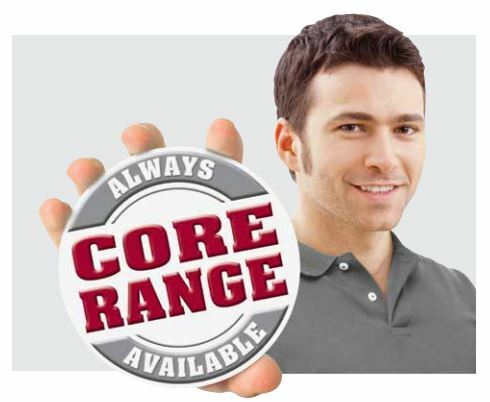 Core Range is our commitment to you that whatever you need to get the job done first time is always available. When you visit any of our SIG Roofing branches nationwide, you’ll always find our Core Range of products in stock – so you can always get on with the job. With many more specialist products available. No-one thinks roofing’s easy – but it’s definitely easier if you know what you’re doing and if you’ve got the right tools. That’s where SIG Roofing comes in. We’re the one stop roofing supplier and we’re here to help. Core Range is just part of our commitment to making your life as easy as possible.